Stiles' and Torres' three-parter on the changing Texas political map, Ramsey on questions about Brian Birdwell's voting history and residency, Aguilar on the Obama administration's immigration crackdown, Reed on hospitals that won't induce early labor, Stiles on what Troy Fraser left off his financial disclosure form, the latest installment of Hu's Face-Off video debate series, Grissom on the problem-plagued Driver Responsibility Program, Galbraith on the controversy over fracking and M. Smith's interview with former Texas Supreme Court Justice Harriet O'Neill: The best of our best from July 26 to 30, 2010. 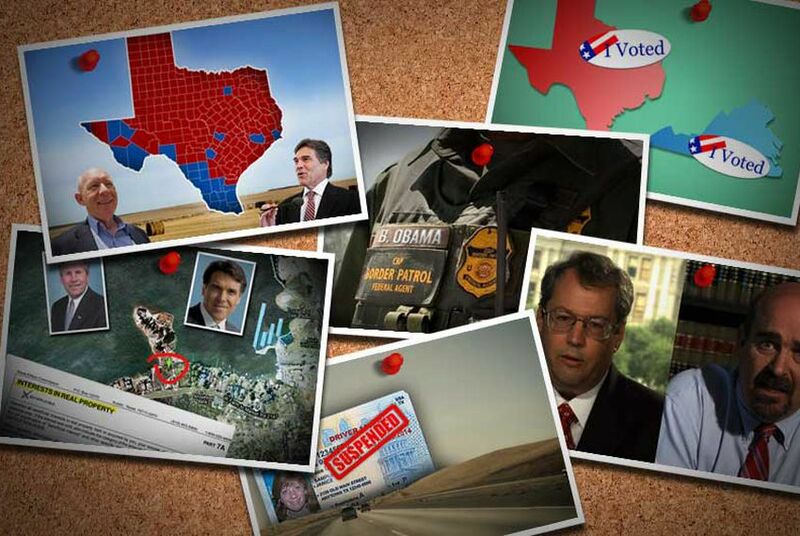 This week, the Tribune and the El Paso Times collaborated on a three-part series exploring the political map of Texas ahead of the November election. The first piece centered on the race for governor and what would have to change for Democrats to win in the politically fortified red state of Texas. The second focused on Latino voting in Texas and why the state's fastest-growing population hasn't yet achieved full strength. The third examined counties' voting patterns — and how those realities affect their political clout. The project also featured interactive elements to visualize the trends, including maps of statewide voting and turnout in recent elections. State Sen. Brian Birdwell, R-Granbury, voted in the November 2004 presidential election twice, choosing between George W. Bush and John Kerry in Tarrant County, Texas, and again in Prince William County, Virginia, according to election records in the two states. Despite grousing from congressmen and state officials in Arizona and Texas — notably Gov. Rick Perry — that the Obama administration has abdicated its role in the protecting the nation's borders from illegal immigration, the Department of Homeland Security’s largest investigative units this year each recorded their highest monthly number of cases referred for prosecution since the Bush administration, according to a report from the Transactional Records Access Clearinghouse at Syracuse University. Should lawmakers pay hospitals more for refusing to induce early labor, which reduces neonatal costs and harm to mothers? Or should the state be kept out of the private decisions of patients and their physicians? State Sen. Troy Fraser, R-Horseshoe Bay, who was involved in a controversial land deal with Gov. Rick Perry, failed to disclose ownership or sale of the property to the Texas Ethics Commission, an apparent violation of a state ethics rules, according to a review of his personal financial statements. The two men battling for a spot on the Texas Railroad Commission go head-to-head — virtually — in the latest installment of our Face-Off video series. Watch as political novice and certified public accountant David Porter, a Midland Republican, debates Democrat Jeff Weems, an oil and gas attorney from Houston, on their respective qualifications for the job, whether there are enough pipeline inspectors and and the proper balance between environmental regulation and economic growth. Efforts to salvage the problem-plagued Driver Responsibility Program ultimately may not shield it from the wrath of its many detractors, including at least one lawmaker who believes we "shouldn't hesitate in getting rid of it." In Texas and nationwide, controversy is escalating over the practice of shooting water, sand and chemicals underground to retrieve natural gas. Some companies have responded by using less dangerous chemicals. Former Texas Supreme Court Justice Harriet O'Neill on her 18 years in the judiciary, women on the court, the all-Republican bench and what she really thinks about judicial elections.